There he goes again, fantasizing about inflicting violence. Back in March, left-wing radio host Mike Malloy went off on a characteristically unhinged rant and threatened that "I will shoot you!" to an unnamed National Rifle Association board member. Update (June 25, 5:48 p.m. EDT): Wurzelbacher has responded in a blog post at RedState, linking to a Smart Girl Politics post which noted that "[o]f the thirty-one signatories [of the anti-Wurzelbacher letter], all but six are registered Democrats or have made financial contributions to Democratic candidates or PACs." "A viral campaign video in which Samuel 'Joe the Plumber' Wurzelbacher links gun control to the Holocaust has sickened some members of Ohio's Jewish community, who sent the GOP congressional candidate a letter on Thursday that calls his claims 'misguided,' 'highly offensive' and 'harmful to the Jewish community,'" Sabrina Eaton informed readers of the Cleveland Plain Dealer in an article uploaded yesterday evening. In the video in question, Wurzelbacher noted that gun control programs in Turkey and Germany preceded the Armenian genocide of 1915-17 and the Holocaust, respectively. In a heated exchange Thursday between CNN’s Zoraida Sambolin and Samuel Wurzelbacher, also known as “Joe the Plumber,” Sambolin dug up comments he made about “gay people” in 2009, causing Wurzelbacher to quip that "this is TMZ. This isn't CNN, is what you're saying." Sambolin also questioned his qualifications to run for office, and mislabeled his liberal opponent as a "conservative Democrat" while branding Wurzelbacher as a "conservative Republican." Joe the Plumber was certainly on to something when he got then-candidate Barack Obama to admit he wanted to redistribute the wealth, according to former Republican presidential candidate and Arkansas governor Mike Huckabee. Huckabee, who now hosts a show aired on the weekends on the Fox News Channel, told "On The Record" host Greta Van Sustren on Nov. 16 that Obama's policies go beyond just the redistribution of wealth, especially on health care. He likened a provision in the House health care bill that would require people to have some sort of health care coverage to a "poll tax." "[W]hile we really wish [the president's priorities] were recovery, getting jobs back - that's the number one thing we ought to be focused on - but it appears to be redistribution," Huckabee said. "That's what's going on in the health care world, where we're trying to make sure that we've redistributed health care, taking it from people who have it, taking from them, giving it to people who may not even desire to have it, and forcing people into an unconstitutional system where they're going to have to virtually pay into a private marketplace in order to get full rights of citizenship. It's the equivalent of a poll tax." Real America is much different from, and more interesting than, that white-bread fantasy, a problem the Republican Party--the party of immigrant bashing--will be wrestling with for the immediate future. Klein conveniently omitted that 2008 presidential nominee Sen. John McCain was hardly an immigrant basher, heavily criticized by conservatives in the GOP for his push for amnesty for illegal immigrants. What's more, it was President Reagan who signed the last amnesty bill in 1986, another inconvenient fact that cuts against Klein suggesting Reagan was a quasi-racist xenophobe. We just received word that C-SPAN 2 is going to air a "slightly abbreviated version" of the Media Research Center's 2009 Gala and Dishonors Awards dinner. It should start airing at 1:26 p.m. EDT. As if Olbermann doesn't graze a “buffet of daily talking points” from an “ultra-liberal media site.” The headline over a post earlier in the day on Media Matters' “County Fair” blog: “Accepting Buckley award, Fox's Hume thanked Media Research Center 'for the tremendous amount of material' they 'provided me for so many years when I was anchoring Special Report. '” Unlike Olbermann, however, Hume almost always credited the MRC so viewers were informed of his source. As if out to prove our point about media bias, the Washington Post's Mary Ann Akers seized on a one-liner by Joe "the Plumber" Wurzelbacher made last night at the MRC Gala and DisHonors Awards. Wurzelbacher, accepting the "Obamagasm Award" on behalf of ABC's Bill Weir, made a crack playing off the orgasmic delight that Chris Matthews and others in the media expressed after watching then-candidate Obama deliver rousing campaign speeches. "God, all this love and everything in the room - I'm horny," Akers quoted Wurzelbacher, before going on to insist that no one in the whole room, especially at her table, understood why he said that. There were many famous people at CPAC this year and I was lucky enough to run into some of them. And some of those I ran into even let me ask them a few questions about media bias. The resulting videos are embedded below the fold. 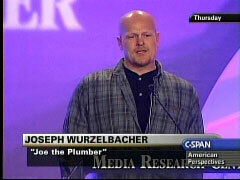 The four interviews I was able to get where with Joe the Plumber, John Ziegler, George Phillips, and Roger Simon. Each have unique experiences with liberal media bias and each articulated different but insightful points about the media. Make sure you check out each of the videos and watch them all the way through. The Washington Post writer gleefully recounted how only 11 people showed up to a Joe the Plumber book signing event in Washington D.C. Farhi added odd asides, such as noting Wurzelbacher's "shiny bullet head." Even the headline, which read "Joe the Author, Plumbing New Lows in Interest," adopted a condescending tone. In the few seconds it took Iraqi journalist Muntather Zaidi to wing a pair of shoes at President George Bush, the Middle East got its own version of Joe the Plumber. Given the flap that ensued when he famously told Joe the Plumber that he wanted to "spread the wealth," I figured Barack Obama wouldn't be making such a suggestion again anytime soon. I figured wrong. I think the important principle, because sometimes when we start talking about taxes, and I say I want a more balanced tax code, people think, well, that's class warfare. No. It turns out that our economy grows best when the benefits of the economy are most widely spread. And that has been true historically.